​For the first time in human history, you can actually give someone a Flying F*ck! 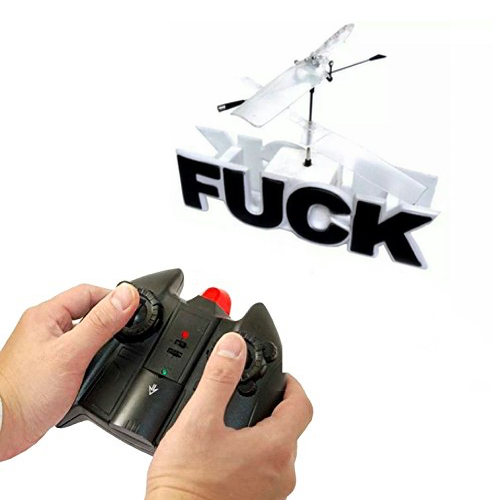 Made from soft-foam and controlled by a two-channel helicopter flight system, the Flying F*ck quickly became our best selling unique gift idea. This is exactly what you know it is! Not merely a novelty, this thing flies! While the flight pattern is hardly that of an Apache, handling is superb, it can be trimmed for stability and flown just like any remote controlled helicopter. Want to show your coworkers what you really think?? The Flying F*ck can masterfully rise over cubicle walls. Someone in your house not getting the message you've sent 1,000 times?! The Flying F*ck can really drive the point home! Blatantly crude and oh-so funny, the RC Flying F*ck helicopter is a fantastic way to express yourself... without having to say a word. Whether you find yourself addicted to RC Helicopters or in need of the perfect gift... you finally found a way to tell that special someone how you feel. This is YOUR Flying F*ck to give!